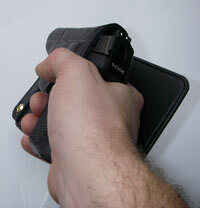 Here are several AVI Videos to demonstrate proper carry and ease of draw using our Pocket Holsters. Which way do I put the holster into my pocket? How do I draw the firearm from the holster? Our Pocket Holsters have a hinged pocket guard (anti-print panel) to allow quick access to your firearm and to facilitate a smooth extraction from your pocket.